Send your Mitzvah or additional thoughts or picture you want to share! Our hearts are heavy with pain on the devastating loss of Rivky (Deren) Berman. Rivky was the youngest daughter of Rabbi Yisrael & Morah Vivi Deren, who have touched and inspired so many of our lives, and the lives of our children in meaningful and powerful ways. Our thoughts and prayers go out to Rabbi Deren and Morah Vivi and the entire family, at this painful and difficult time. We each want to be there for them and help ease the pain- but how? Rivky was raised in an atmosphere of doing and giving to others and with the ideals that the Derens live their lives by. For those of you who merited to know Rivky, you know, how what was instilled in her was so part of who she was. For those of you who were not privileged to meet her personally, allow us to describe what Rivky embodied. Rivky lived her life with joy and perseverance. Despite difficult health issues throughout her entire life, she never allowed this to drag her down or define her. Rivky lived every moment to its fullest. Hashem blessed her with perhaps one of her greatest wishes of all - to get married. Rivky married an exceptional human being, a Stamford boy, Shmuely Berman and just less than 4 years ago, when we stood at that magical celebration, we knew that Shmuely and Rivky were a power duo, ready to tackle any obstacle that was going to present itself and those obstacles presented themselves, time and time again and Rivky with the dedicated Shmuely at her side overcame each one. To know Rivky was to love Rivky, to crave just 5 more minutes in her presence, to catch just a little of her sunshine, her love for life and joy in living it! Rivky shared freely and openly, on facebook, in person, on a number of different videos taken of her, her view on this gift we call LIFE. She uplifted and inspired all with her positivity, her vigor and her outlook that all is always good, despite how it may feel or appear. Click here to read more about Rivky's life. Many of you have asked us how you can help and what you can do for the Derens – first and foremost it is with your Mitzvot and good deeds. Each time a mitzvah is done in her merit, Rivky's light and life continue to shine. 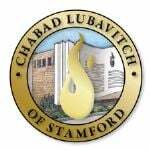 For those who would like to participate in Shiva meals and needs -please email Morahleah@stamfordChabad.org to shop, cook or contribute. May we have simchas and happy occasions to share with one another and may we merit the ultimate joy of life – the coming of Moshiach, when it will be all OK and only revealed good!